On the 18th (Wed), buy something for everyone on your list at 16th Street Mall. To see photos, maps, reviews, and more tourist information, read Denver trip itinerary maker tool . Sydney, Australia to Denver is an approximately 21.5-hour flight. You can also do a combination of train and flight. The time zone difference when traveling from Sydney to Denver is minus 17 hours. Prepare for much colder weather when traveling from Sydney in December: high temperatures in Denver hover around 7°C and lows are around -8°C. You'll have a few hours on the 19th (Thu) to wrap things up before traveling to Estes Park. Deepen your sense of the past at sights like Chapel on the Rock and Holzwarth Historic Site. Satisfy your inner culture vulture at Images of Rocky Mountain National Park and Snowy Peaks Winery. Venture out of the city with trips to Rocky Mountain National Park (Alluvial Fan, Chasm Falls, & more), Winter Park Resort (in Winter Park) and Devil's Backbone Trail (in Loveland). There's lots more to do: hike along Cub Lake Trail, get a taste of the local shopping with Aspen and Evergreen Gallery, appreciate the views at Many Parks Curve Overlook, and explore the striking landscape of Sheep Lakes. To find other places to visit, reviews, traveler tips, and other tourist information, you can read our Estes Park trip planner . You can drive from Denver to Estes Park in 1.5 hours. Alternatively, you can do a combination of bus and taxi. Expect a daytime high around 9°C in December, and nighttime lows around -9°C. Finish up your sightseeing early on the 23rd (Mon) so you can go by car to Cheyenne. Cheyenne is the capital and most populous city of the US state of Wyoming and the county seat of Laramie County. Popular historic sites such as Fort Laramie National Historic Site and Abbey of St. Walburga are in your itinerary. Get some cultural insight at Cheyenne Depot Museum and Laramie Plains Museum. Venture out of the city with trips to Ivinson Mansion (in Laramie), Gateway Natural Area (in Bellvue) and Riverbend Ponds Natural Area (in Fort Collins). It doesn't end there: take an in-depth tour of Nelson Museum of the West and ponder the world of politics at Wyoming State Capitol. For photos, other places to visit, maps, and more tourist information, use the Cheyenne trip app . You can drive from Estes Park to Cheyenne in 2 hours. Other options are to do a combination of taxi and bus; or do a combination of taxi and shuttle. When traveling from Estes Park in December, plan for a bit cooler days and about the same nights in Cheyenne: temperatures range from 4°C by day to -9°C at night. On the 27th (Fri), wrap the sightseeing up by early afternoon so you can travel to Jackson Hole. Get some cultural insight at Mormon Row Historic District and Mangelsen Images of Nature. You'll discover tucked-away gems like Grand Targhee Ski Resort and Chapel of the Transfiguration. 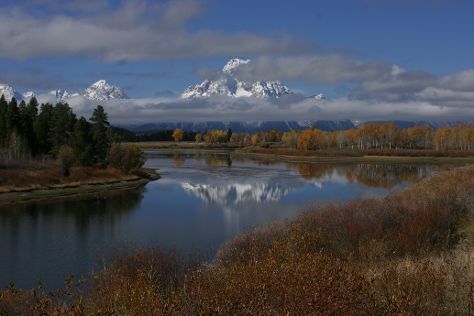 Step out of Jackson Hole with an excursion to Snake River Overlook in Moose--about 58 minutes away. Spend the 28th (Sat) surrounded by wildlife at Grand Teton. And it doesn't end there: don't miss a visit to Oxbow Bend, stroll through Cascade Canyon Trail, and take in the awesome beauty at Rendezvous Mountain. To find traveler tips, reviews, maps, and tourist information, read our Jackson Hole day trip planning website . Do a combination of shuttle and flight from Cheyenne to Jackson Hole in 5 hours. Alternatively, you can do a combination of car and flight; or drive. Plan for little chillier temperatures traveling from Cheyenne in December, with highs in Jackson Hole at -3°C and lows at -16°C. Finish your sightseeing early on the 31st (Tue) to allow enough time to drive to West Yellowstone. Eschew the tourist crowds and head to Uncle Tom's Trail and Firehole Canyon Drive. Visiting Grand Loop Road and Midway Geyser Basin will get you outdoors. Change things up with these side-trips from West Yellowstone: Yellowstone National Park (Gibbon Falls, Virginia Cascade Drive, & more). There's still lots to do: take a memorable tour with Tours and stop by Eagle's Store. For photos, more things to do, ratings, and other tourist information, read our West Yellowstone trip itinerary maker app . You can drive from Jackson Hole to West Yellowstone in 3 hours. Alternatively, you can take a bus; or do a combination of bus and shuttle. Plan for little chillier temperatures traveling from Jackson Hole in December, with highs in West Yellowstone at -7°C and lows at -21°C. You'll have a few hours on the 4th (Sat) to wrap things up before traveling to Coeur d'Alene. Coeur d'Alene is the largest city and county seat of Kootenai County, Idaho, United States. Old Mission State Park and Northern Pacific Depot are good opportunities to explore the local culture. Step off the beaten path and head to Tubbs Hill Nature Trails and Cataldo Mission. Get out of town with these interesting Coeur d'Alene side-trips: Wallace (Oasis Bordello Museum & Lookout Pass), Emerald Creek Garnet Area (in Saint Maries) and Bonners Ferry (Kootenai National Wildlife Refuge & Heart Rock Wines). To see ratings, reviews, more things to do, and tourist information, go to the Coeur d'Alene route maker site . Traveling by car from West Yellowstone to Coeur d'Alene takes 7 hours. Alternatively, you can do a combination of shuttle and flight; or do a combination of shuttle, flight, and bus. You'll gain 1 hour traveling from West Yellowstone to Coeur d'Alene due to the time zone difference. Expect somewhat warmer weather when traveling from West Yellowstone in January: highs in Coeur d'Alene hover around 1°C, while lows dip to -5°C. On the 8th (Wed), wrap the sightseeing up by early afternoon so you can travel back home.